I now know I can trust my instincts. On our annual XC ski weekend, I like to go out before breakfast to either ski, snowshoe or take photographs. This year was no exception. 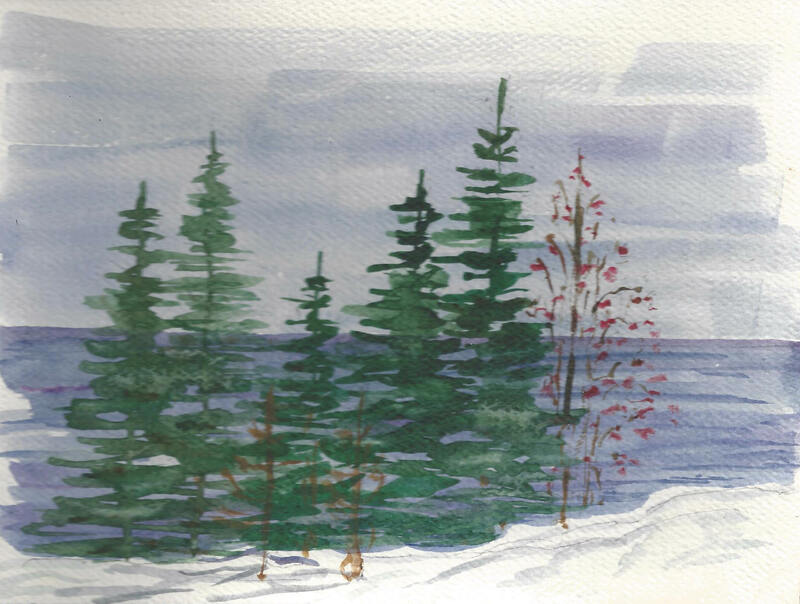 Before leaving the cabin for an early morning walk, I popped a few muffins in the oven along with some pears to bake, leaving Susan in charge of them while she pursued her own morning passion – painting. The morning was gray and uninspiring, but it was pleasant wandering through the fresh snow that had fallen during the night on the small roadway right next to Lake Superior’s shore. Mine were the only tracks in the snow, and the rest of the world seemed asleep. The area was an eclectic collection of tiny cottages, large homes with sweeping views and tumble down sheds. I wasn’t adventurous enough to trudge through the deep snow to get to the water’s edge, so I had to confine my photography to what I could see from the road. As I walked, my thoughts kept wandering back to the oven. Did I tell Susan when the muffins would be done? Did I set it to the right temperature? Despite my best efforts to dismiss that responsibility, something nagged at me. But I walked on – intent to let go and savor the freshness of the morning. Opening the door to the cabin, my senses were assaulted by the harsh burning smell. And it wasn’t the blaze in the fireplace. 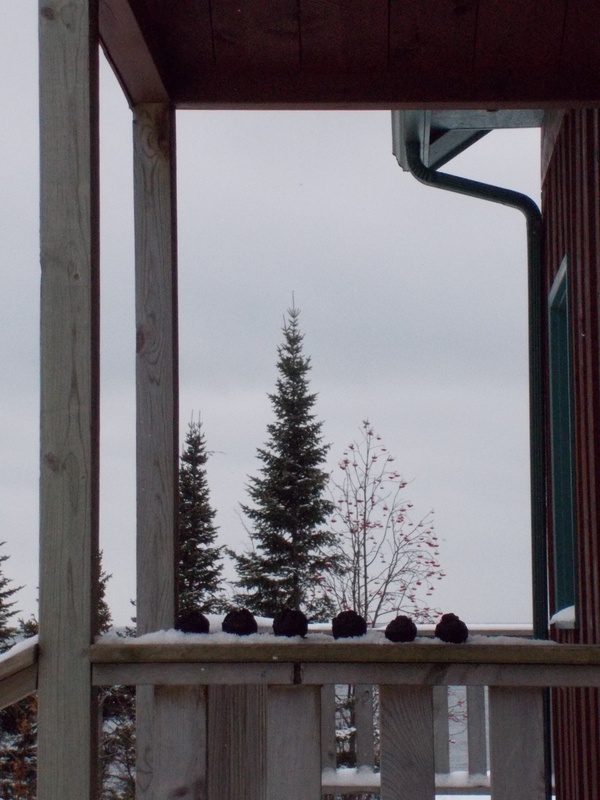 Susan looked at me sheepishly saying “I failed…” Suddenly the six black rocks outside on the deck railing took on significance as I recognized them for what they were. And the charred pears that melded themselves into the baking dishes were equally appalling. I knew it! I shouldn’t have left my baking in the hands of an artist absorbed in her work. But in fact, I was wrong. And Susan’s self-blame was misplaced. Instead of activating the lower heat element, the oven malfunctioned and turned on the broiler, charring our breakfast to death. No amount of care or attention could have stemmed the tide on that disaster waiting to happen. All we could do was laugh. And poke fun at ourselves and the situation. And our six black muffins. Sitting in a row. My instincts were right – something was bound to go amiss. I just didn’t know what. And Susan’s painting? It turned out quite nicely. A lot better than the muffins. 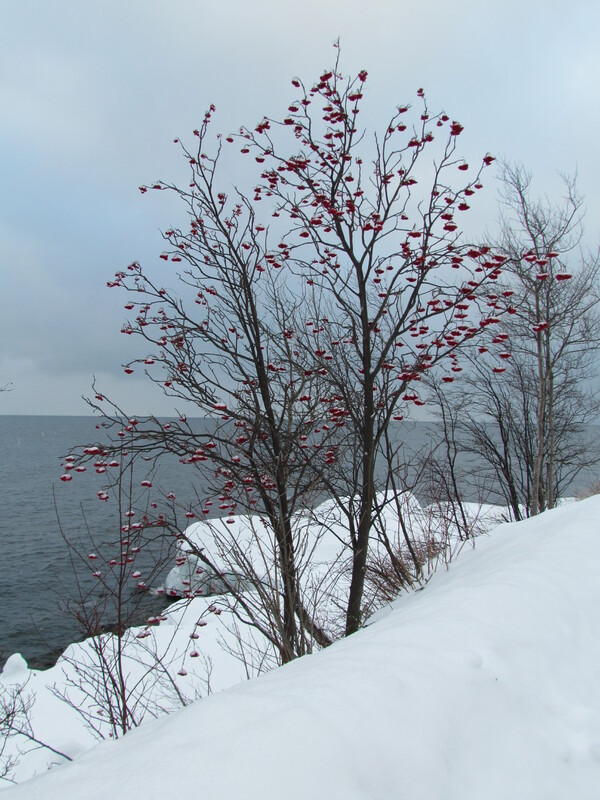 This entry was posted in Life Up North and tagged Cabin, Friendship, Lake Superior, North Shore, Photography by Molly. Bookmark the permalink. Such a sweet story. Taking control and having to let go: only to find burnt muffins! Life is so funny. Miss you Molly! Molly.